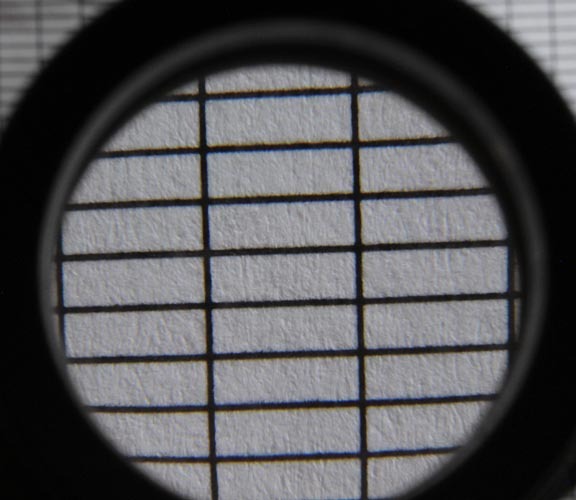 Ideally a magnifier for examining finger prints should provide a sharply focused and flat wide field with a magnification of about 4 1/2 X and avoid the need to be close to the lens so as to limit fatigue. An achromatic aplanatic lens combination with large aperture and good eye relief would fit this requirement. 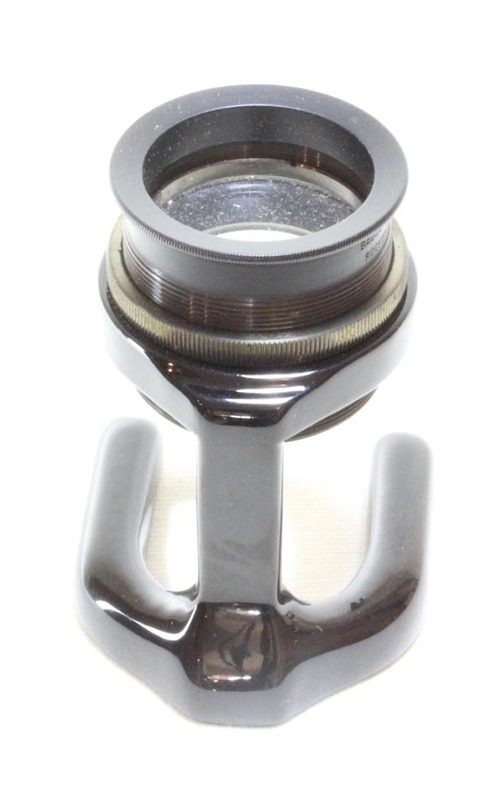 Such magnifiers were available in the early twentieth century and soon were promoted for the purpose. Obviously these instruments were well suited to other purposes. 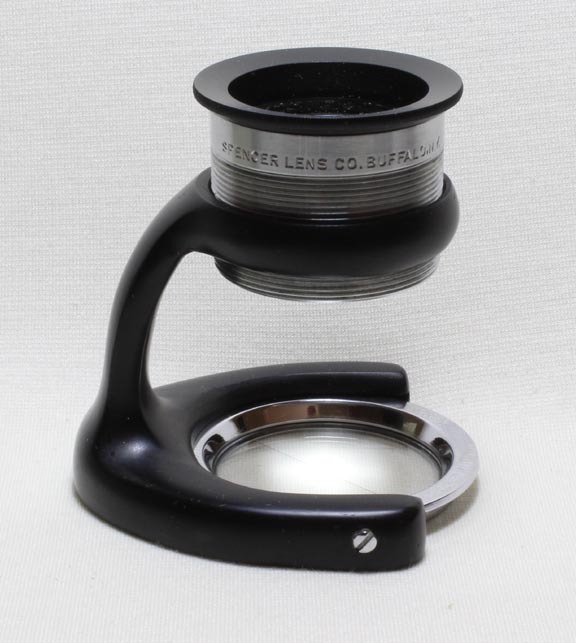 Magnifiers with lenses nearly identical to these are still sold today by companies specializing in forensic tools, but the quality of the B & L and Spencer models on this page were never surpassed. The usual power for these is 4 1/2 X. 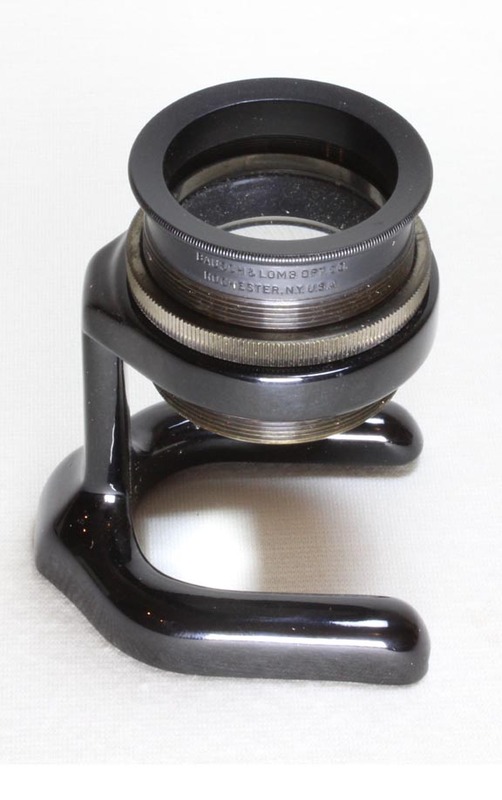 Both B & L and Spencer called these magnifiers 'Utility Magnifier' without the slot in the foot to accept the Henry inserts, and 'Fingerprint Magnifier' when the slot was present. 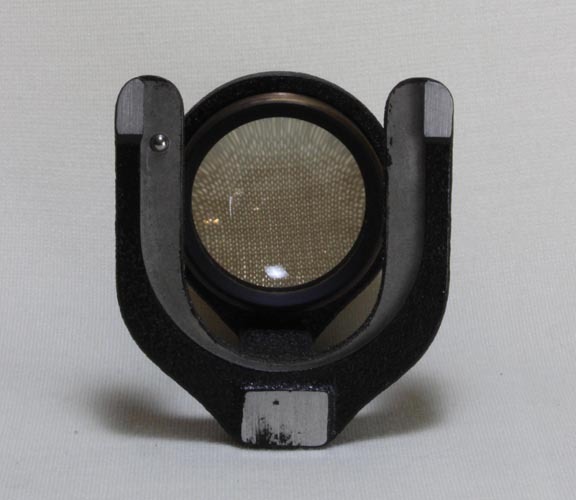 BAUSCH & LOMB 'FINGERPRINT MAGNIFIER', c. 2nd to 3rd Qtr of 20th C.
Bausch & Lomb advertised this magnifier no later than the second quarter of the twentieth century. Although all of its advantages were mentioned, it was not specifically promoted as a fingerprint magnifier initially; the box with this instrument does list it as a 'Fingerprint Magnifier' and is identical to the box for the next instrument on this page. The use of the postal code dates it to after 1940. Note that at the bottom of the instrument there is a dovetail slot in the horse shoe foot to accept inserts with a ball-bearing under one side of the foot to hold the insert in place. The earlier version of this instrument, shown here, has a gloss black finish; the later version, shown next, has a flat crinkle finish. The instrument shown here also has a locking ring to lock it in focus; this additional feature is advertised as a separate accessory to add to the functionality of the device. 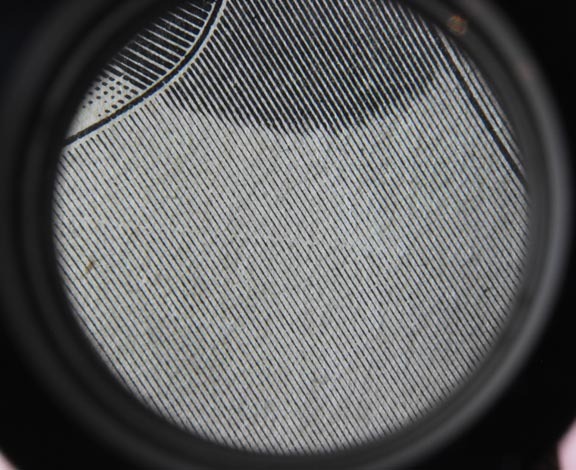 As can be seen in the image of an engraving taken through the lens, the entire field is sharp and flat. The notation suggests this was not officially marketed as a fingerprint magnifier until after the 1935 catalog. In the 1929 catalog, this microscope was referred to as the 'Utility Magnifier' though that name referred more to its many possible uses than its quality, as the quality is very high. In the 1940 B & L catalog, the 'Utility Magnifier' did not appear to have the dovetail slots that this instrument, and the following example both have, though in 1940, among the uses listed was for fingerprint analysis. The instrument is in excellent condition. Bausch & Lomb. Note that at the bottom of the instrument there is a dovetail slot in the horse shoe foot to accept inserts with a ball-bearing under one side of the foot to hold the insert in place. This slightly later version of this instrument, shown here, has a 'crinkle' black finish; the earlier version, shown above, has a gloss black smooth finish. The instrument shown here also has a locking ring to lock it in focus; this additional feature was advertised as a separate accessory to add to the functionality of the device, and to my knowledge, was not offered for the Spencer/AO instrument. The box is in good condition but the microscope itself is in mint condition. The postal code on the box indicates the instrument was made after 1942. 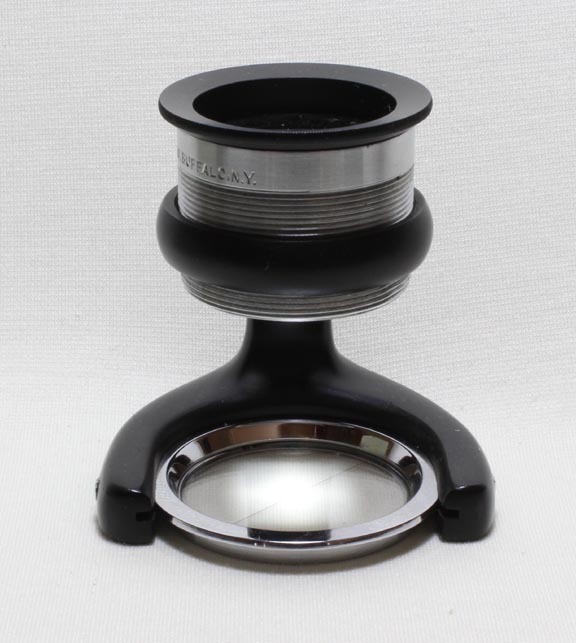 This magnifier, obviously in competition to the B & L examples is a very similar and was also called the 'Utility Magnifier'. 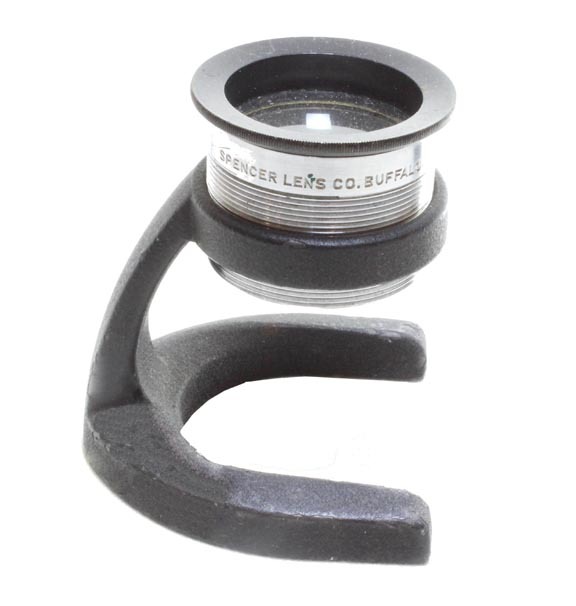 It is signed 'SPENCER LENS CO. BUFFALO, N.Y.' It has a chrome plated barrel and no locking ring. It has a later type of crinkle finish, as did the later Bausch & Lomb variety, but this example does not have a slot in the foot to accept the inserts (which Spencer refers to as 'dispositives'). 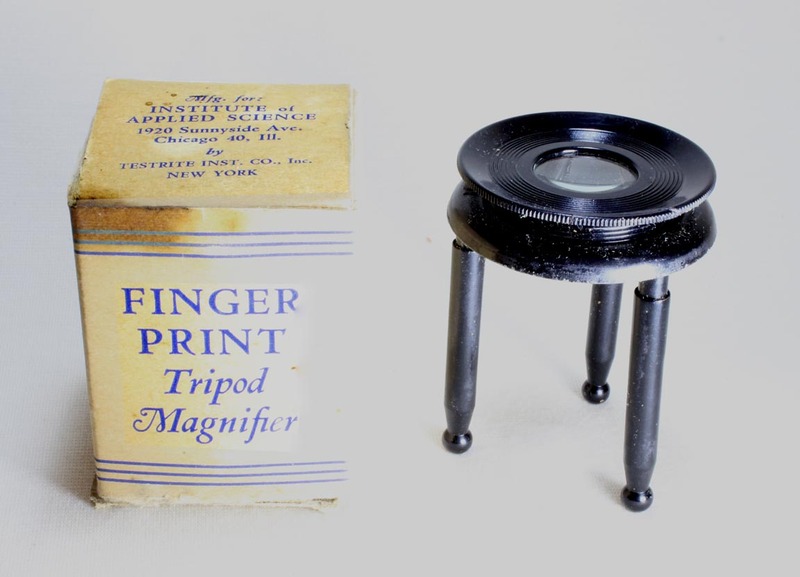 the 1946 Spencer example of this magnifier, seen in the next paragraph, does have that feature, and was therefore offically called a 'Fingerprint Magnifier'. 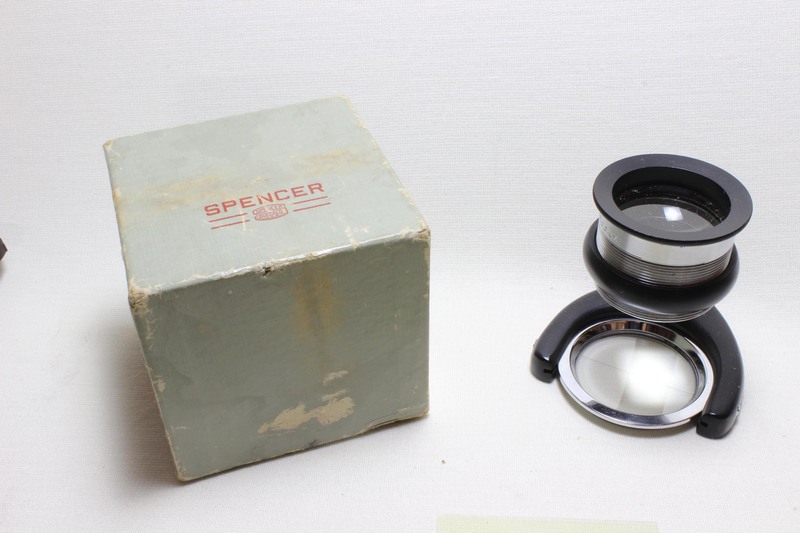 Spencer mentions in their catalog entries that the Utility model lacked the slot for the inserts which the official 'Fingerprint Magnifier' did have. 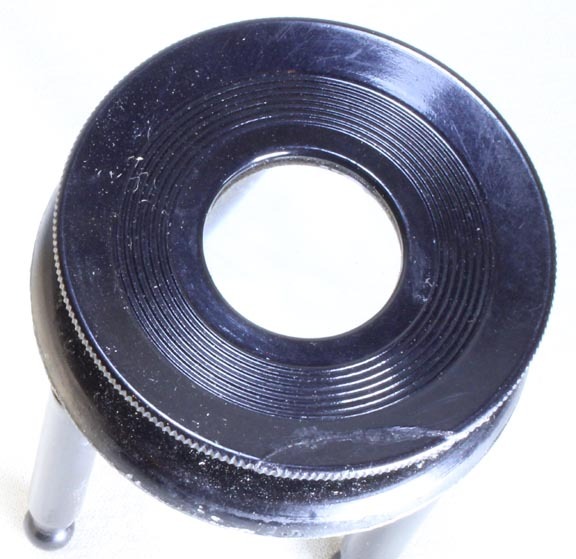 The optical part of this instrument is in very good condition, though the foot has some losses of the black paint. 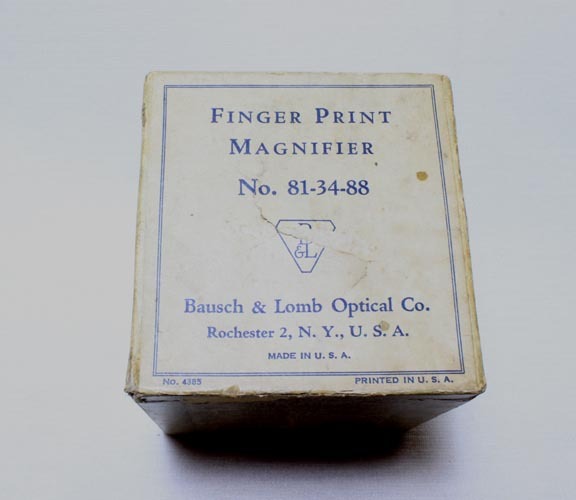 Signed on the instrument: 'Spencer Lens Co. Buffalo, N.Y.' and on the box in red letters: 'Spencer' and in a lens logo: 'Buffalo U.S.A.' There are stickers on the box one of which reads: '624 FINGERPRINT MAGNIFIER'. Two stickers which acted as seals for the bottom of the box are signed: 'American Optical Company, Scientific Instrument Division, Buffalo N.Y.' The AO logo is incorporated into these labels. 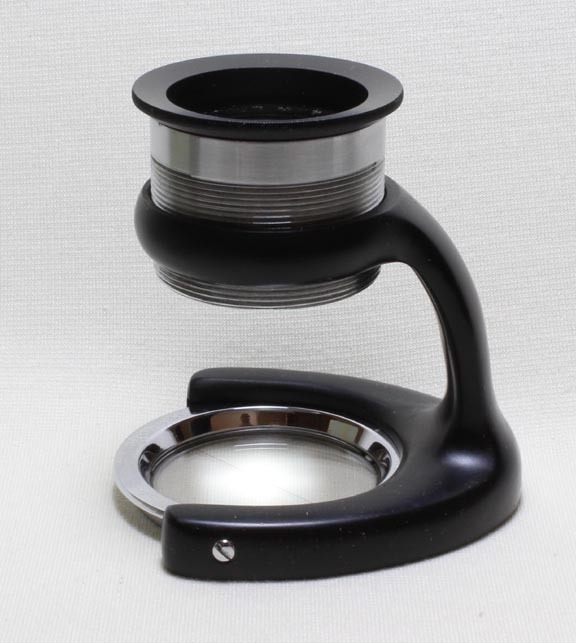 This magnifier, is similar to the one shown in the paragraph immediately above, but has the additional feature of a slot in the foot to accept the 'Henry' inserts or 'dispositives'. The insert is held in place by two horizontal sprung bearings, one on each side of the foot. 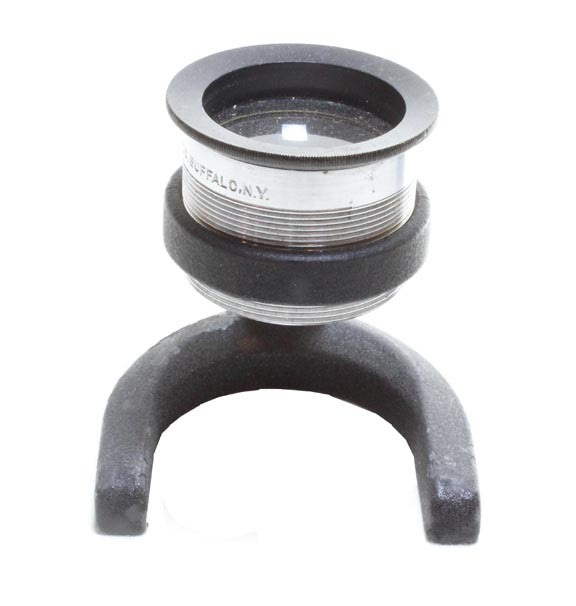 This differs from the B & L foot where a single bearing is found in a vertical orientation. 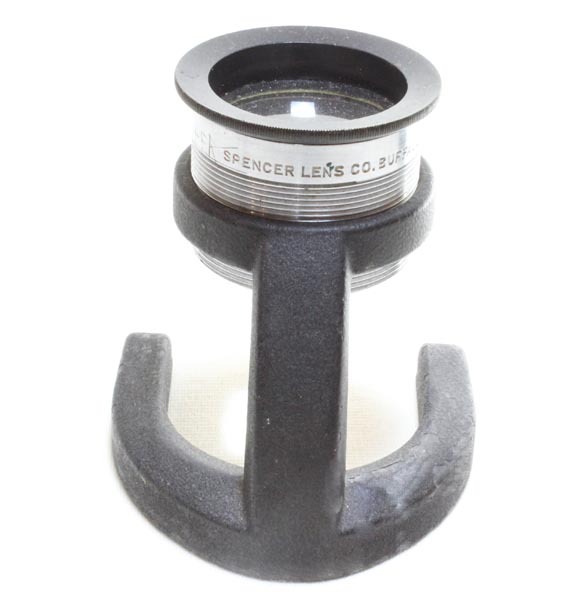 Like the Spencer Utility Magnifier, this example also has a chrome plated barrel and no locking ring. It has a smooth flat black finish. This example came with a Henry insert (or 'dispositive') in a chrome plated ring. The clear part is made of thin glass. There is also a thin plastic overlay with concentric circle pattern, which was separate and not in a ring. This overlay is quite scuffed. The original receipt, from 'Micro Mart' of Washington, D.C., dated 1947 also came in the box. 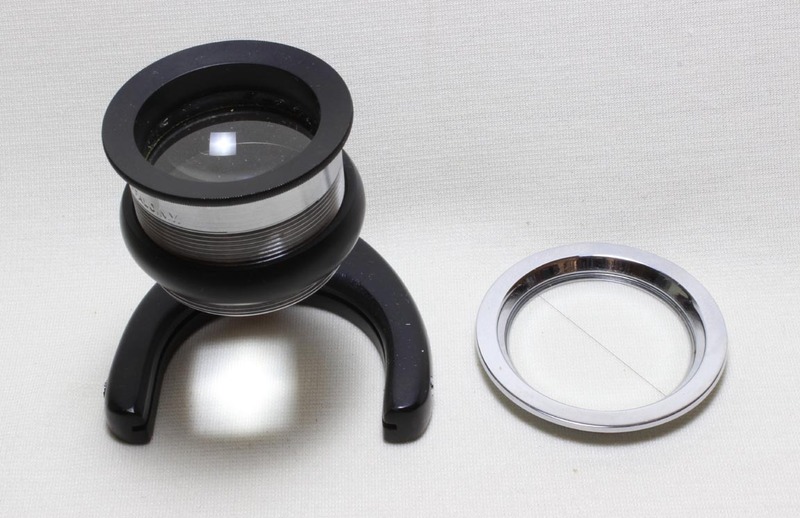 Other than the box, which is in fair condition, this magnifier is in mint condition. Spencer was the first major maker of microscopes in America, starting to produce them in 1838. 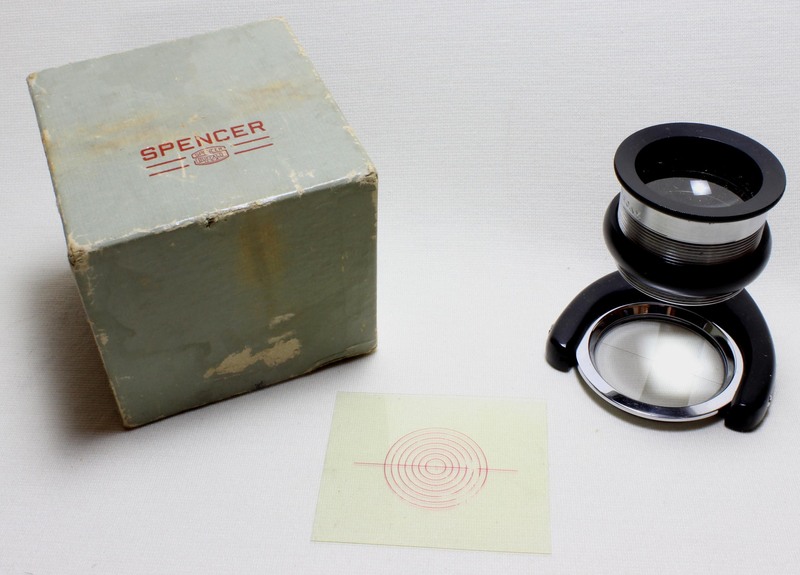 The Spencer Lens company was acquired in 1935 by American Optical (AO). Spencer Lens became the AO Scientific Instrument division. Prior to this, AO had concentrated on spectacle frames and lenses. Spencer/AO and Bausch & Lomb were the only American microscope manufacturers to survive well into the 20th Century. None survived into the 21st Century. 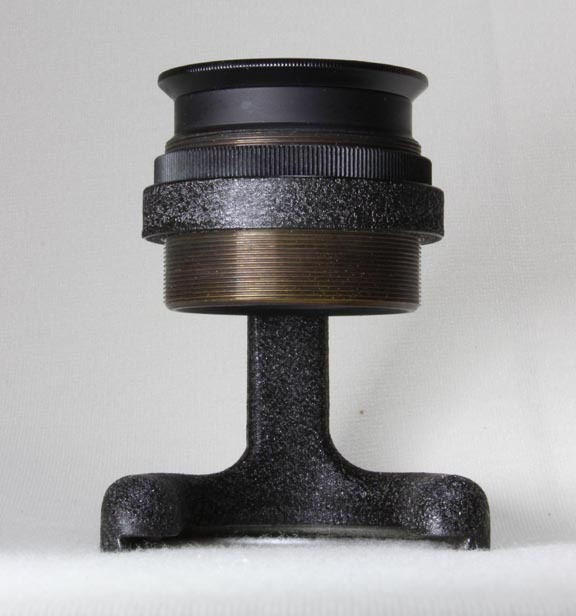 This magnifier closely resembles the brass tripod magnifiers made in large numbers during the nineteenth and early twentieth century but has a steel tripod frame and a bakelite main body. 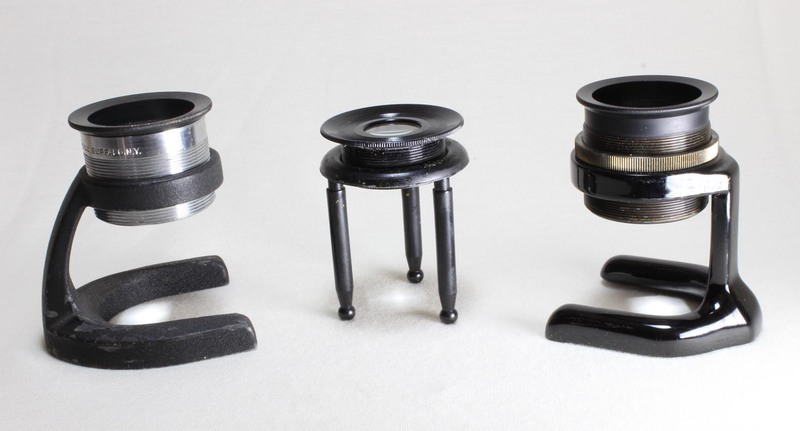 It is taller than the traditional little tripods and its lens is slightly bigger with a wider field of view than most of the old brass varieties. It is however, still grossly inferior in quality to the other two shown above, with a much smaller field of view than the Spencer and Bausch & Lomb types. The postal code indicates it was made after World War II started. Although the ancients used fingerprints to sign documents, the concept that every fingerprint is different and could be used for identification started with William Herschel in India in 1858. This idea spread slowly and was not widely accepted until the early twentieth century. The first crime solved by fingerprint identificiation dates back to 1892 and was in Argentina. It was not until 1901-1903 that England, then France, and then the United States started the practice. A centralized fingerprint repository was assigned to the FBI starting in 1924. 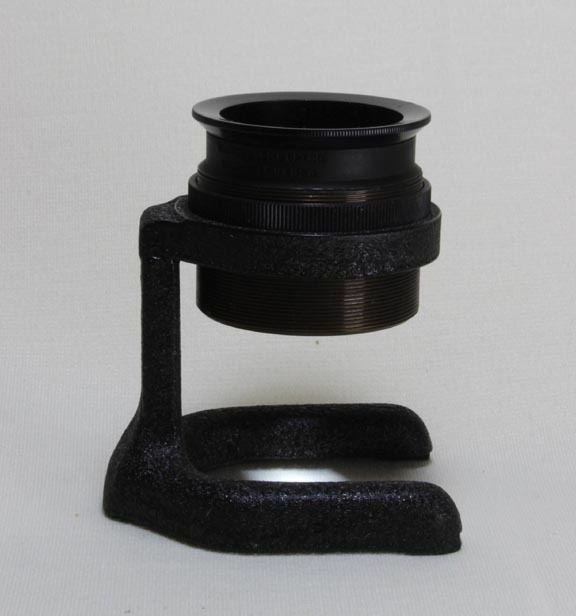 Obviously, in the beginning, regular magnifying glasses were used to identify fingerprints, but soon optical manufacturers began to make magnifiers marketed specifically for this purpose, or in many cases, simply marketed their suitable magnifiers already in production for the purpose. 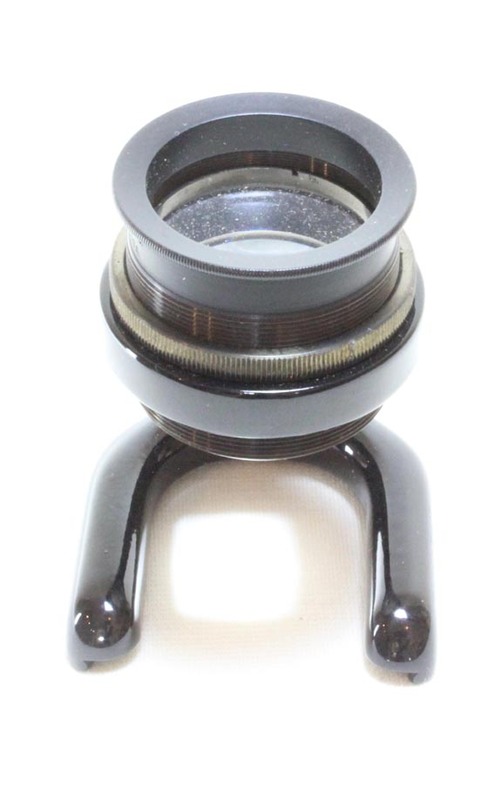 Having used these magnifiers, I can say they are certainly optimized for the practice. The three examples shown on this page are typical, though likely there were many more. Eventually, various inserts were added to the foot to help with identification; these would divide the fingerprint into areas to be matched to others as part of a classification system. The most famous of these systems is the 'Henry.' 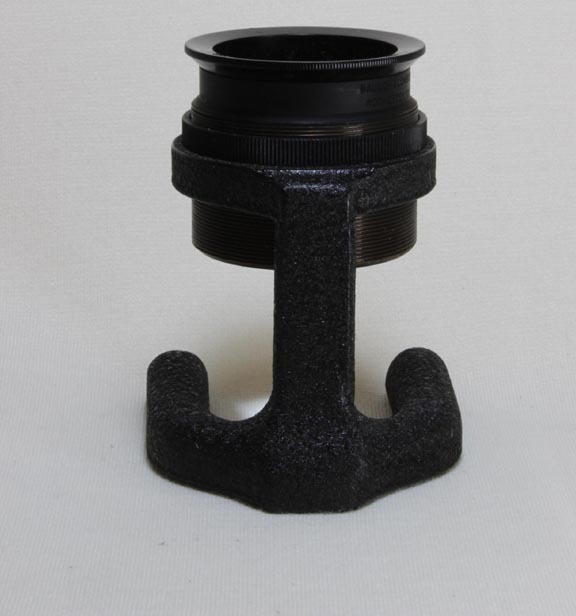 The insert used for this purpose, is therefore known as a Henry insert. 'Henry' inserts can be seen with the 1947 Spencer Fingerprint microscope in this collection. Nowadays, fingerprint identification and analysis has moved to the purview of technology with the now-famous AFIS (Automated Fingerprint Identification System) system with computers playing the role that the human brain and fingerprint magnifier used to. Nevertheless, the old-fashioned fingerprint magnifier is still marketed today. A good one today costs between $200-300, though as in the past, cheaper versions are also marketed.